If the latest beer coming to the taps at Strangeways sounds like heavy metal band’s upcoming album, there is a very good reason for that. “The Snake & The Snowman” is a collaborative project from the minds of Head Brewer Mike Hiller and metal/punk music industry veteran Dave Witte. You’ve probably seen Dave behind the bars at Commercial Taphouse and The Answer Brewpub. This Belgian Strong Golden Ale is a nod to a beer formulated by some fellow Mad Brewers that changed Witte’s life and cemented his life-long devotion to craft beer. This bottle conditioned ale, which underwent oak barrel aging, utilizes white candy sugar to add a pleasant sweetness, and Nugget, Magnum, and Horizon hops for balance. Enjoy fresh as well as procure more to store in a cool area away from direct light to age into divine bliss. Mike: Not really. Stille Nacht by de Dolle was one of the beers that changed how Dave Witte thought about beer, and this beer is an homage to Stille Nacht. The Stille Nacht label sports a snowman wearing a scarf. Through discussions with Jim Callahan (Barf comics and designer of our cases) we decided the scarf should be a snake. Hence The Snake (Dave Witte) and the Snowman (Mike Hiller). Dave: Haha. Yes it does, well partially anyway. The Snake part is a Whitesnake reference cause the name I wanted use initially was In the Stille of The Night (Whitesnake song). The beer is also homage to Still Nacht, the beer that changed my life. 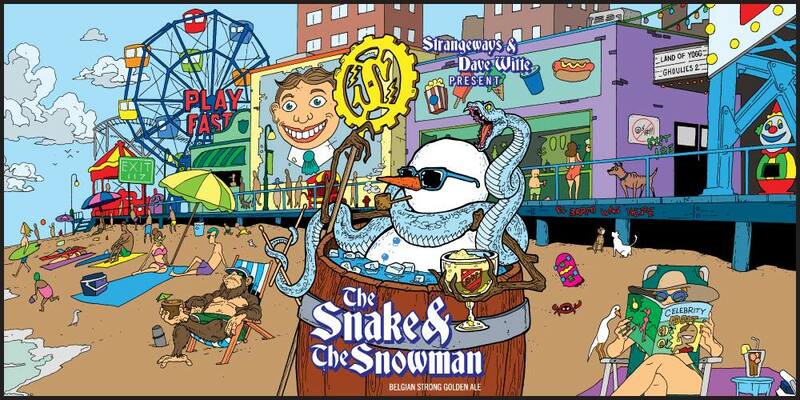 The Snake & The Snowman will start flowing from Strangeways taps today Saturday June 27th at noon. Head over to the Facebook event for more details.